Early U.S. commercial banks were for-profit business firms, usually structured as joint-stock companies. Many, but by no means all, obtained corporate charters from their respective state legislatures. Although politically controversial, commercial banks, the number and assets of which grew quickly after 1800, played a key role in early U.S. economic growth.1 Commercial banks, savings banks, insurance companies and other financial intermediaries helped to fuel growth by channeling wealth from savers to entrepreneurs. Those entrepreneurs used the loans to increase the profitability of their businesses and hence the efficiency of the overall economy. As financial intermediaries, commercial banks pooled the wealth of a large number of savers and lent fractions of that pool to a diverse group of enterprising business firms. The best way to understand how early commercial banks functioned is to examine a typical bank balance sheet.2 Banks essentially borrowed wealth from their liability holders and re-lent that wealth to the issuers of their assets. Banks profited from the difference between the cost of their liabilities and the net return from their assets. 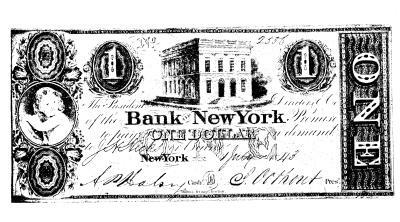 A typical U.S. commercial bank in the late eighteenth and early nineteenth centuries owned assets such as specie, the notes and deposits of other banks, commercial paper, public securities, mortgages, and real estate. Investment in real estate was minimal, usually simply to provide the bank with an office in which to conduct business. Commercial banks used specie, i.e. gold and silver (usually minted into coins but sometimes in the form of bars or bullion), and their claims on other banks (notes and/or deposits) to pay their creditors (liability holders). They also owned public securities like government bonds and corporate equities. Sometimes they owned a small sum of mortgages, long-term loans collateralized by real property. Most bank assets, however, were discount loans collateralized by commercial paper, i.e. bills of exchange and promissory notes “discounted” at the bank by borrowers. Most bank loans were “discount” loans, not “simple” loans. Unlike a simple loan, where the interest and principal fall due when the loan matures, a discount requires only the repayment of the principal on the due date. That is because the borrower receives only the discounted present value of the principal at the time of the loan, not the full principal sum. Commercial banks acquired wealth to purchase assets by issuing several types of liabilities. Most early banks were joint-stock companies, so they issued equities (“stock”) in an initial public offering (IPO). Those common shares were not redeemable. In other words, stockholders could not demand that the bank exchange their shares for cash. Stockholders who wished to recoup their investments could do so only by selling their shares to other investors in the secondary “stock” market. Because its common shares were irredeemable, a bank’s “capital stock” was its most certain source of funds. Holders of other types of bank liabilities, including banknotes and checking deposits, could redeem their claims during the issuing bank’s open hours of operation, which were typically four to six hours a day, Monday through Saturday. A holder of a deposit liability could “cash out” by physically withdrawing funds (in banknotes or specie) or by writing a check to a third party against his or her deposit balance. A holder of a banknote, an engraved promissory note payable to the bearer very similar to today’s Federal Reserve notes,4 could physically visit the issuing bank to redeem the sum printed on the note in specie or other current funds, at the holder’s option. Or, a banknote holder could simply use the notes as currency, to make retail purchases, repay debts, make loans, etc. After selling its shares to investors, and perhaps attracting some deposits, early banks would begin to accept discount loan applications. Successful applicants would receive the loan as a credit in their checking accounts, in banknotes, in specie, or in some combination thereof. Those banknotes, deposits, and specie traveled from person to person to make purchases and remittances. Eventually, the notes and deposits returned to the bank of issue for payment. Early banks had to manage their balance sheets carefully. They “failed” or “broke,” i.e. became legally insolvent, if they could not meet the demands of liability holders with prompt specie payment. Bankers, therefore, had to keep ample amounts of gold and silver in their banks’ vaults in order to remain in business. Because specie paid no interest, however, bankers had to be careful not to accumulate too much of the precious metals lest they sacrifice the bank’s profitability to its safety. Interest-bearing public securities, like U.S. Six Percent bonds, often served as “secondary reserves” that generated income but that bankers could quickly sell to raise cash, if necessary. When bankers found that their reserves were declining too precipitously they slowed or stopped discounting until reserve levels returned to safe levels. Discount loans were not callable.5 Bankers therefore made discounts for short terms only, usually from a few days to six months. If the bank’s condition allowed, borrowers could negotiate a new discount to repay one coming due, effectively extending the term of the loan. If the bank’s condition precluded further extension of the loan, however, borrowers had to pay up or face a lawsuit. Bankers quickly learned to stagger loan due dates so that a steady stream of discounts was constantly coming up for renewal. In that way, bankers could, if necessary, quickly reduce the outstanding volume of discounts by denying renewals. Early bankers maintained profitability by keeping losses from defaults less than the gains from interest revenues.6 They kept defaults at an acceptably low level by reducing what financial theorists call “information asymmetry.” The two major types of information asymmetry are adverse selection, which occurs before a contract is made, and moral hazard, which occurs after contract completion. The information is asymmetrical or unequal because loan applicants and borrowers naturally know more about their creditworthiness than lenders do. (More generally, sellers know more about their goods and services than buyers do.) Bankers, in other words, must create information about loan applicants and borrowers so that they can assess the risk of default and make a rational decision about whether to make or to continue a loan. Moral hazard arises from the fact that people are basically self-interested. If given the opportunity, they will renege on contracts by engaging in risky activities with, or even outright stealing, lenders’ wealth. For instance, a borrower might decide to use a loan to try his luck at the blackjack table in Atlantic City rather than to purchase a computer or other efficiency-increasing tool for his business. Another borrower might have the means to repay the loan but default on it anyway so that she can use the resources to take a vacation to Aruba. In order to reduce the risk of default due to information asymmetry, lenders must create information about borrowers. Early banks created information by screening discount applicants to reduce adverse selection and by monitoring loan recipients and requiring collateral to reduce moral hazard. Screening procedures included probing the applicant’s credit history and current financial condition. Monitoring procedures included the evaluation of the flow of funds through the borrower’s checking account and the negotiation of restrictive covenants specifying the uses to which a particular loan would be put. Banks could also require borrowers to post collateral, i.e. property they could seize in case of default. Real estate, slaves, co-signers, and financial securities were common forms of collateral. Colonial America witnessed the formation of several dozen “banks,” only a few of which were commercial banks. Most of the colonial banks were “land banks” that made mortgage loans. Additionally, many of them were government agencies and not businesses. All of the handful of colonial banks that could rightly be called commercial banks, i.e. that discounted short-term commercial paper, were small and short-lived. Some, like that of Alexander Cummings, were fraudulent. Others, like that of Philadelphia merchants Robert Morris and Thomas Willing, ran afoul of English laws and had to be abandoned. ** = The Bank of North America gained a second charter in 1786 after its original Pennsylvania state charter was revoked. Pennsylvania, Massachusetts, and New York chartered the bank in 1782. # = This firm was chartered as a water utility company but began banking operations almost immediately. The first U.S. commercial banks helped early national businessmen to overcome a “crisis of liquidity,” a classic postwar liquidity crisis caused by a shortage of cash, and an increased emphasis on the notion that “time is money.” Many colonists had been content to allow debts to remain unsettled for years and even decades. After experiencing the devastating inflation of the Revolution, however, many Americans came to see prompt payment of debts and strict performance of contracts as virtues. Banks helped to condition individuals and firms to the new, stricter business procedures. Early U.S. commercial banks had political roots as well. Many Revolutionary elites saw banks, and other modern financial institutions, as a means of social control. The power vacuum left after the withdrawal of British troops and leading Loyalist families had to be filled, and many members of the commercial elite wished to fill it and to justify their control with an ideology of meritocracy. By providing loans to entrepreneurs based on the merits of their businesses, and not their genealogies, banks and other financial intermediaries helped to spread the notion that wealth and power should be allocated to the most able members of post-Revolutionary society, not to the oldest or best groomed families. After 1800, the number, authorized capital, and assets of commercial banks grew rapidly. (See Table 2.) As early as 1820, the assets of U.S. commercial banks equaled about 50 percent of U.S. aggregate output, a figure that the commercial banking sectors of most of the world’s nations had not achieved by 1990. Sources: For total banks and authorized bank capital, see Fenstermaker (1965). I added the Bank of the United States and the Second Bank of the United States to his figures. I estimated assets by multiplying the total authorized capital by the average ratio of actual capital to assets from a large sample of balance sheet data. Commercial banks caused considerable political controversy in the U.S. As the first large, usually corporate, for-profit business firms, banks took the brunt of reactionary “agrarian” rhetoric designed to thwart, or at least slow down, the post-Revolution modernization of the U.S. economy. Early bank critics, however, failed to see that their own reactionary policies caused or exacerbated the supposed evils of the banking system. For instance, critics argued that the lending decisions of early banks were politically-motivated and skewed in favor of rich merchants. Such was indeed the case. Overly stringent laws, usually championed by the agrarian critics themselves, forced bankers into that lending pattern. Many early bank charters forbade banks to raise additional equity capital or to increase interest rates above a low ceiling or usury cap, usually 6 percent per year. When market interest rates were above the usury cap, as they almost always were, banks were naturally swamped with discount applications. Forbidden by law to increase interest rates or to raise additional equity capital, banks were forced to ration credit. They naturally lent to the safest borrowers, those most known to the bank and those with the highest wealth levels. Early banks were extremely profitable and therefore aroused considerable envy. Critics claimed that bank dividends greater than six percent were prima facie evidence that banks routinely made discounts at illegally high rates. In fact, banks earned more than they charged on discounts because they lent out more, often substantially more, than their capital base. It was not unusual, for example, for a bank with $1,000,000 equity capital to have an average of $2,000,000 on loan. The six percent interest on that sum would generate $120,000 of gross revenue, minus say $20,000 for operating expenses, leaving $100,000 to be divided among stockholders, a dividend of ten percent. More highly leveraged banks, i.e. banks with higher asset to capital ratios, could earn even more. Early banks also caused considerable political controversy when they attempted to gain a charter, a special act of legislation that granted corporate privileges such as limited stockholder liability, the ability to sue in courts of law in the name of the bank, etc. Because early banks were lucrative, politicians and opposing interest groups fought each other bitterly over charters. Rival commercial factions sought to establish the first bank in emerging commercial centers while rival political parties struggled to gain credit for establishing new banking facilities. Politicians soon discovered that they could extract overt bonuses, taxes, and even illegal bribes from bank charter applicants. Again, critics unfairly blamed banks for problems over which bankers had little control. Despite the efforts of a few critics, most Americans rejected anti-bank rhetoric and supported the controlled growth of the commercial banking sector. They did so because they understood what some modern economists do not, namely, that commercial banks helped to increase per capita aggregate output. Unfortunately, the discussion of banks’ role in economic growth has been much muddied by monetary issues. Banknotes circulated as cash, just as today’s Federal Reserve notes do. Most scholars, therefore, have concentrated on early banks’ role in the monetary system. In general, early banks caused the money supply to be procyclical. In other words, they made the money supply expand rapidly during business cycle “booms,” thereby causing inflation, and they made the money supply contract sharply during recessions, thereby causing ruinous price deflation. The economic importance of early banks, therefore, lies not in their monetary role but in their capacity as financial intermediaries. At first glance, intermediation may seem a rather innocuous process — lenders are matched to borrowers. Upon further inspection, however, it is clear that intermediation is a crucial economic process. Economies devoid of financial intermediation, like those of colonial America, grow slowly because firms with profitable ideas find it difficult to locate financial backers. Without intermediaries, search costs, i.e. the costs of finding a counterparty, and information creation costs, i.e. the costs of reducing information asymmetry (adverse selection and moral hazard), are so high that few loans are made. Profitable ideas cannot be implemented and the economy stagnates. Intermediaries reduce both search and information costs. Rather than hunt blindly for counterparties, for instance, both savers and entrepreneurs needed only to find the local bank, a major reduction in search costs. Additionally, banks, as large, specialized lenders, were able to reduce information asymmetry more efficiently than smaller, less-specialized lenders, like private individuals. By lowering the total cost of borrowing, commercial banks increased the volume of loans made and hence the number of profitable ideas that entrepreneurs brought to fruition. Commercial banks, for instance, allowed firms to implement new technologies, to increase labor specialization, and to take advantage of economies of scale and scope. As those firms grew more profitable, they created new wealth, driving economic growth. Bodenhorn, Howard. A History of Banking in Antebellum America: Financial Markets and Economic Development in an Era of Nation-Building. New York: Cambridge University Press. 2000. Cowen, David J. The Origins and Economic Impact of the First Bank of the United States, 1791-1797. New York: Garland Publishing, 2000. Lamoreaux, Naomi. Insider Lending: Banks, Personal Connection, and Economic Development in Industrial New England. New York: Cambridge University Press, 1994. Wright, Robert E. Origins of Commercial Banking in America, 1750-1800. Lanham, MD: Rowman & Littlefield. 2001. Perkins, Edwin J. American Public Finance and Financial Services, 1700-1815. Columbus: Ohio State University Press, 1994. Sylla, Richard. “U.S. Securities Markets and the Banking System, 1790-1840.” Federal Reserve Bank of St. Louis Review 80 (1998): 83-104. Wright, Robert. The Wealth of Nations Rediscovered: Integration and Expansion in American Financial Markets, 1780-1850. New York: Cambridge University Press. 2002. Cleveland, Harold van B., Thomas Huertas, et al. Citibank, 1812-1970. Cambridge: Harvard University Press, 1985. Davis, Joseph S. Essays in the Earlier History of American Corporations. New York: Russell & Russell, 1917. Eliason, Adolph O. “The Rise of Commercial Banking Institutions in the United States.” Ph.D., diss. University of Minnesota, 1901. Fenstermaker, J. Van. The Development of American Commercial Banking: 1782-1837. Kent,Ohio: Kent State University, 1965. Fenstermaker, J. Van and John E. Filer. “Impact of the First and Second Banks of the United States and the Suffolk System on New England Bank Money: 1791-1837.” Journal of Money, Credit and Banking 18 (1986): 28-40. Gras, N. S. B. The Massachusetts First National Bank of Boston, 1784-1934. Cambridge: Harvard University Press, 1937. Green, George. Finance and Economic Development in the Old South: Louisiana Banking, 1804-1861. Stanford: Stanford University Press, 1972. Hammond, Bray. Banks and Politics in America, from the Revolution until the Civil War. Princeton: Princeton University Press, 1957. Hedges, Joseph Edward. Commercial Banking and the Stock Market Before 1863. Baltimore: Johns Hopkins Press, 1938. Hunter, Gregory. The Manhattan Company: Managing a Multi-Unit Corporation in New York, 1799-1842. New York: Garland Publishing, 1989. Redlich, Fritz. The Molding of American Banking: Men and Ideas. New York. Johnson Reprint Corporation, 1968. Schweikart, Larry. Banking in the American South from the Age of Jackson to Reconstruction. Baton Rouge: Louisiana State University Press, 1987. Wainwright, Nicholas B. History of the Philadelphia National Bank: A Century and a Half of Philadelphia Banking, 1803-1953. Philadelphia: Philadelphia National Bank, 1953. 1 Which is to say that they increased real per capita aggregate output. Aggregate output is the total dollar value of goods and services produced in a year. It can be measured in different ways, the two most widely used of which are Gross National Product (GNP) and Gross Domestic Product (GDP). The term per capita refers to the total population. Aggregate output may increase simply because of additional people, so economists must take population growth into consideration. Similarly, nominal aggregate output might increase simply because of price inflation. Real aggregate output means output adjusted to account for price changes (inflation or deflation). Real per capita aggregate output, therefore, measures the economy’s “size,” adjusting for changes in population and prices. 2 A balance sheet is simply a summary financial statement that lists what a firm owns (its assets) as well as what it owes (its liabilities). 3 Early bankers used the formula for present value familiar to us today: PV = FV/(1+i)n where PV = present value (sum received today), FV = future value (principal sum), i = annual interest rate, and n = the number of compounding periods, which in this example is one. So, PV = 100/1.06 = 94.3396 or $94.34. 5 In other words, banks could not demand early repayment from borrowers. 6In order to maintain bank revenues, bankers are willing, under competitive conditions, to take some risks and therefore to suffer some defaults. For example, making a simple year-long loan for $100 at 10 percent per annum, if the banker determines that the borrower represents, say, only a 5 percent chance of default, is clearly superior to not lending at all and foregoing the $10 interest revenue. Early U.S. banks, however, rarely faced such risk-return tradeoffs. Because the supply of bank loans was inadequate to meet the huge demand for bank loans, and because banks were constrained by usury law from raising their interest rates higher than certain low levels, usually around 6 to 7 percent, bankers could afford to lend to only the safest risks. Early bankers, in other words, usually faced the problem of too many good borrowers, not too few.